Over the Summer, Amazon made three moves that when looked at individually are interesting but when reviewed holistically show their plan to dominate the mobile space, which includes social gaming. First, Amazon released Living Classics, a Facebook social game. Then, it announced it had added Epix and NBC Universal content to Amazon prime. 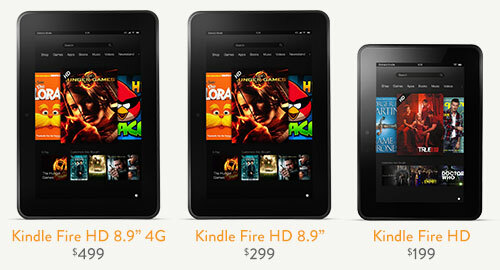 Last week, Amazon released details of its new Kindle Fire models. Taken together, these moves suggest Amazon could be as important a partner to social game companies as Apple and Facebook (and more important than Google). Starting with the most recent activity, the new Fires look like they will have broad market appeal, from entry-level consumers who want a sub-$200 device to power users who want an iPad equivalent but prefer to save a few hundred dollars. Moreover, their 4G option and attractive pricing for connectivity might evolve tablet use from predominantly WiFi to a truly mobile device that people use everywhere (I know my 3G iPad really never leaves my side). If I am right about 4G adoption, then you will start to see huge numbers of consumers using their tablet for apps rather than their Smartphone. Couple these products with Amazon’s unmatched ability to drive hundreds of millions of potential consumers to them (the real estate on Amazon’s homepage is probably the most valuable advertising space on the planet, much more so than Google’s as visitors to Amazon are already interested in buying something), and there is probably no scenario where Amazon does not reach at least second place in tablet sales. The Epix (and NBC) move was also huge. The move by Amazon to add Epix, the pay cable network, allows it to add movies from Paramount, Lionsgate and MGM to its Amazon Prime streaming service. These include movies like The Hunger Games, Transformers Prime and Iron Man 2, giving it a much more attractive catalog of content than its competitors (e.g., NetFlix), even though they have access to much the same content. The NBC deal gives Amazon Prime cult TV shows like Parks and Recreation, Heroes and Battlestar Galactica. Given that the new Kindle Fires are optimized to run Amazon Prime (and it is not available on iOS devices), it represents a huge selling point. Any of the millions of people who subscribe to Amazon Prime will have to make the choice of buying a Fire device and seeing the content for free as part of their subscription or paying for it twice so they can view it on their iOS device (if the content is even available in the App Store). The final piece of the puzzle is Living Classics. On the face of it, there was no reason for Amazon to launch a Facebook game. It does not work with the Kindle Fire (nor future Fires), does not leverage Amazon’s customer base or their consumer relationships. Also, it puts Amazon in the content business (which it is slightly in book publishing) but not through channels it controls. Given that Amazon is one of the most strategic thinking, long-term looking companies in the world, they also probably did not create a Facebook game on a whim. What is most likely is that if they want to create a social gaming ecosystem comparable or better than Facebook’s, what better way to gain a deep understanding of this ecosystem than to participate in it. Living Classics puts Amazon under the covers with Facebook, letting them see how Facebook works with developers to support and profit from them. It is a lot better to learn by doing than to learn by reading Inside Social Games (or this blog). Taken holistically, by the end of this year we should expect Amazon to have a robust tablet business, where they are not only providing the hardware (which they do not really care about) but an entertainment ecosystem, where consumers go for movies, music, tv shows AND SOCIAL GAMES. As a social game company, you need to look at this opportunity before it gets too crowded. Is the implication that you think that they will discontinue the Amazon Instant Video (Prime & Purchased) app for the iPad? Good point, Greg, and I actually meant to address it in my post. My feeling is that Amazon will eventually (and your guess is as good as mine on timing) limit what i8t provides through its iOS app and keep the top content for the Fire (I am also thinking they will limit what is available on other Android devices). It will take a while, but as they add more premium content they eventually will need to offer tiered levels of service regardless.